Mercer County’s Family and Children First Coordinator works with families who have children with special needs (either physical, educational, emotional or other), with the primary goal of reducing out-of-home placement for these children. Generally, this work involves coordinating the services provided to the families, holding service coordination meetings with the parents and service providers, and staying in contact with all parties once a coordination plan has been developed. 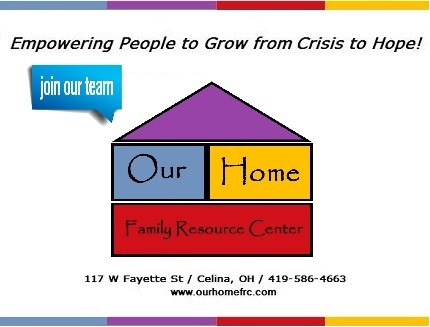 The coordinator works out of Our Home Family Resource Center, with the help and support of Our Home’s Director. The Family and Children First Coordinator typically works with area schools, local mental health services, and Mercer County Children Services & Job and Family Services. Depending upon the needs of a family, the coordinator may also work with health care providers or other agencies that provide services. The coordinator is responsible for number of reports, applications, and budgeting. This 20 hour per week (average) position is ideal for someone with experience in social work, education, or mental health who is seeking a meaningful, part-time position. Send a cover letter with your resume to kmescher@ourhomefrc.com by April 22, 2019. In a cover letter, explain your interest in the position and your qualifications.